The Vadolibero bike shelf is highly functional but also quite visually appealing. The shelf is targeted toward urban bikers who might not have a spacious garage or basement to store their bike. While this bike shelf allows for convenient storage, it is not all about functionality. Milan based Vadolibero designed the structure in the mold of an entertainment center with multiple compartments. It really does serve as a beautiful indoor feature piece that puts one’s bike on full display. 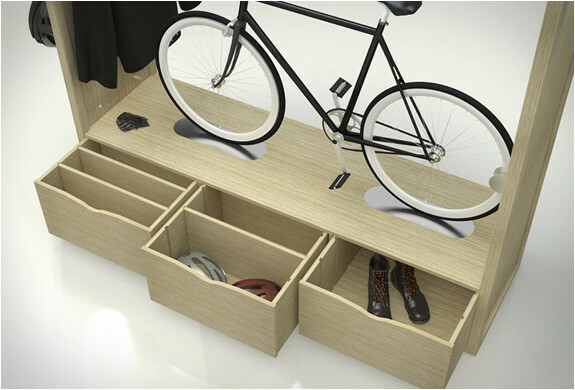 Many consider Vadolibero’s bike shelf as a piece of art that double as a convenient bike storage space. This bike shelf is perfect for bike lovers who view their bikes as prized possessions. The structure demands the attention of all onlookers. 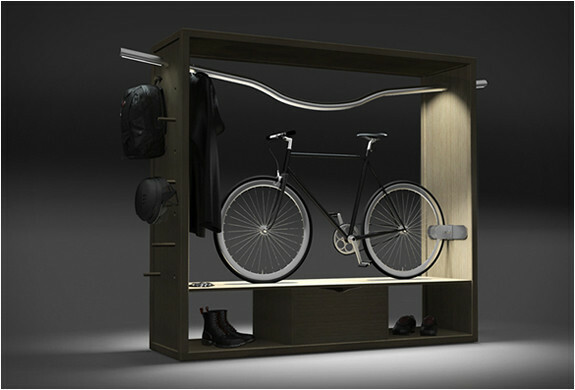 It is ideal for those who live in apartments and desire an aesthetically pleasing way to store their bike. Its modular build empowers bikers to keep their rides firmly in place with a stainless steel clamp. The clamp can be easily altered to fit any bike’s unique handlebars width and wheel size. 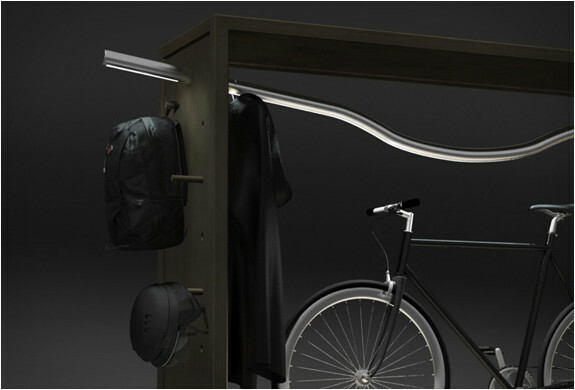 Vadolibero’s bike shelf even includes a clothes rack that can also be used as a lamp to illuminate the bike frame for the ultimate in visual pleasure. Bikers can even hang their jackets and other sundries along the wooden poles on the bike shelf’s side panels. The bike shelf also has a spacious lower compartment for a bike helmet, pad lock, water bottle and other biking gear. It is clear that Vadolibero invested plenty of effort and research into building this multifunctional bike shelf design.